The aim of this exercise will be to take this data and try and write some code which will automatically generate recipes for us (at least in terms of the combinations of ingredients which will go well together). At the moment the whole thing is one very long string (data made up of symbols which don’t have a specific meaning as a command in a programming sense), and we would like to split the string up into more bite-sized (haha!) chunks which we can put into a lovely visual form and then pull out recipes from it. We will show in the detailed post that we can extract from the text all the details about which food goes well with which in a simple matrix form. How can we display this graphically? Well, we can think that every ingredient is a point, and every statement “A goes well with B” is a line joining ingredients (points) A and B. Thus, the information is well represented as a graph. Not a graph in the sense of a graphical representation of a function from x to y (f: ), but a graph in the sense of a series of vertices (also called nodes) and lines joining them . Remember, each line (also called an edge in graph theory) joining two ingredients (vertices) means that they go well together. So caramel and pear go well together and coconut and curry leaf go well together. 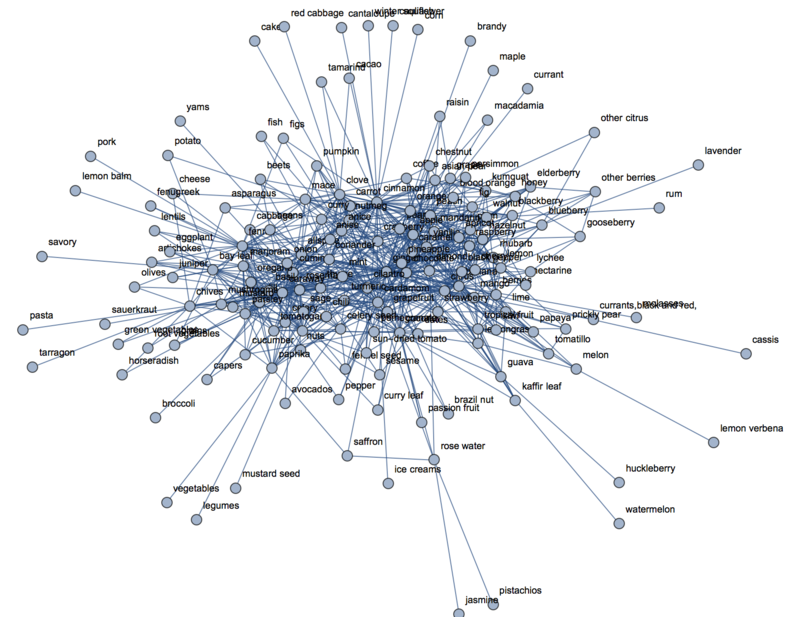 Remember that this is simply a small sampling of ingredients and links, and so there are links here which should be there in the full data but are not. For instance pear and vanilla go well together. What does this mean in the sense of the graph? Well, it will be a set of points where each point is connected to every other in the set. This can also be described as a totally connected subgraph, also known as a clique. 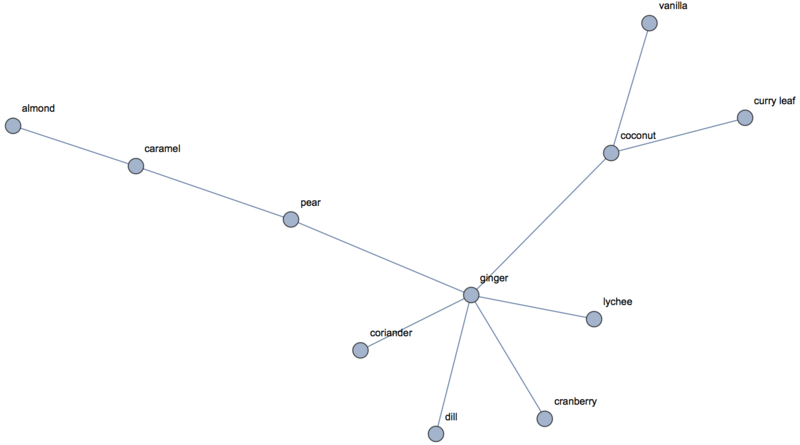 Thus, if we find the cliques in the graph, we will have found recipes! Here you can see that mandarin goes well with nutmeg, mandarin goes well with cinnamon and cinnamon goes well with nutmeg. Three ingredients which go well together and thus a recipe of three ingredients is formed…ok, so not quite a recipe, but at least a list of ingredients which can become the basis of a recipe. Actually Mathematica only finds cliques like this which are not subgraphs of larger cliques (known as maximal cliques), so we have to work a little harder to find all 40 or so cliques of size 7. Well, that’s kinda neat – we’ve just found sets of 7 ingredients, all of which go well with one another. For any cooks out there, these combinations won’t be particularly surprising, though the allspice, apple, cardamom, cilantro, clove, coriander, ginger combination is perhaps a little unusual and sounds quite a bit like a variation of a Vietnamese salad. We can do better than this. We can ask for cliques which contain certain ingredients, or even combinations of ingredients. For instance we can ask for cliques with vanilla and lemongrass. Apparently there are two cliques with these ingredients, the largest of which is chocolate, coconut, ginger, vanilla, lemongrass which sounds pretty interesting! Don’t worry about the syntax here if you are not familiar with Mathematica – this is just asking for the maximal shortest path between ingredients. However, I’m not completely convinced about some of the supposedly bad combinations. For instance, apparently maple and watermelon are very bad flavour pairings. This certainly doesn’t seem like a bad combination to me and so I think that we are seeing the limitation with the relatively small number of flavour pairings shown in the text. We would need a more comprehensive flavour pairing list in order to investigate this further. There are some rather surprising combinations of flavours which go well together. For instance, caviar and white chocolate is supposed to be a good pairing due to the presence of certain amine compounds in both of them. Ok, so these are some of the simple things we can play around with. 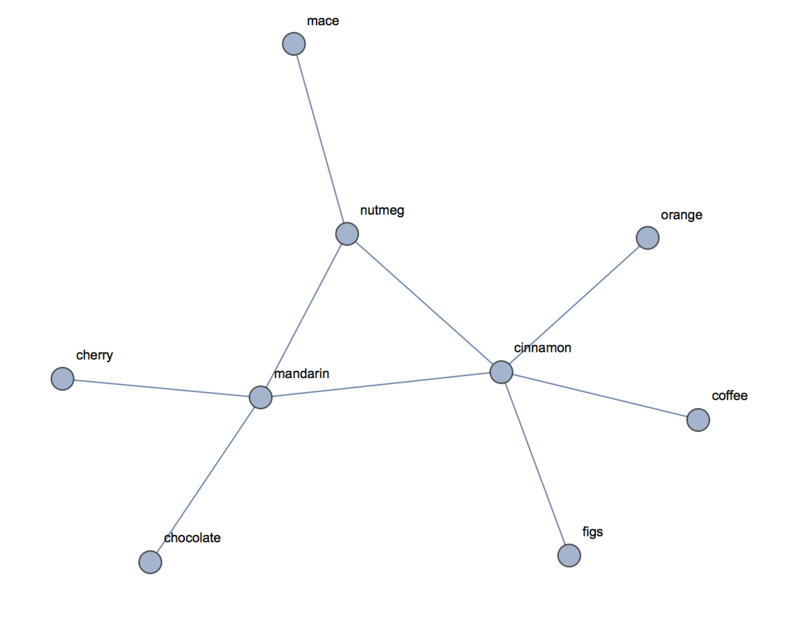 In the next post I will show how we actually coded this in Mathematica using concepts like Editdistance and some simple graph theoretic commands. Interesting, looking forward to the next post Could you maybe talk about some neuroscience in a future post? Mathematical neuroscience is a great idea – I’ll see what we can do! I’ll include this in the next post.